Buddhism in RussiaIn the early 17th century, Tibetan Buddhism spread north from Mongolia to Buryat communities of the Baikal region. The second wave came directly from Tibet. Aiming for weakening the influence of Mongols and Manchurs in the region, the tsar conferred the title of Bandido Khambo Lama on the priors of Gusinoozersk Datsan to acknowledge them as leaders of Buryat Buddhism. Thus, Buryat tradition became officially independent of the Mongolian Church. In 1741, Empress Elizabeth issued a decree that recognized the Lamaistic belief in Buryatia and authorized establishing of 11 monasteries (datsans) with 150 lamas on the staff. This is considered the date of the official recognition of Buddhism in Russia. There were schools opened at datsans and books printed. In the 18th century, Tibetan Buddhism from Mongolia reached Turkic population of Tuva, though the first wave of Buddhism had come there from Uigurs in the 9th century. Like in the Baikal region, it was mainly the Gelug tradition; the Nyingma tradition also spread widely. The priors of Chadan Khura were given the title of Khambu Lama as leaders of Tuva Buddhism. Since Tuva, like Mongolia, was under Manchurs’ authority until 1912, the Khambu Lamas of Tuva were subordinate directly to Bogdo Gegens in Urga. Buddhism in Tuva had significantly closer relations to Mongolia than Buryat Buddhism; besides, it coexisted peacefully with the local tradition of shamanism. People came to see shamans on certain cases while consulting Buddhist priests on the others. In the early 17th century, the ancestors of Kalmyks separated from the Oirats of Dzungaria and migrated to the region between the Volga and the Don River, north to the Caspian Sea. They brought their own tradition of Tibetan Buddhism with them. Namkhai Guiyatso, the Oirat of Zai Pandita, gave them a great help by developing the Kalmyk-Oirat written language on the base of the Mongolian alphabet. The leader of Kalmyk Buddhism was appointed by the Russian tsar and was titled Lama Of The Kalmyk People. His residence being situated in Astrakhan, he possessed complete independence from the Mongols, Bandido Khambo Lama of Buryats alike. Kalmyks received spiritual guidance directly from Tibet, and owing to their natural syncretism, they adopted rites of the Sakya and Kagyu traditions as well as the Gelug one, which was the most widely practiced. Ivolgin datsan (Ivolga monastery. ), Buryatia, RussiaBy 1846, 34 datsans had been built in Buryatia. With much effort and a lot of expenses, Buryats managed to import a vast number of the sacred books from Tibet, China, and Mongolia, and adopted many living practices of both the dominant Gelug and other schools. In 1869, Buddhists of Tsugol Datsan began studying Indo-Tibetan medicine under the guidance of Mongolian lama Choi Manramba; presently such studies were initiated in several other places. Formation of the basic institutions of higher theological education after the Tibetan pattern had been completed in 1876, when a school of Duinkhor Kalachakra was established at Aginsk Datsan. Book publishing was developing rapidly. In 1887, there were already 29 publishing houses, which had produced about 2,000 titles in Tibetan and Mongolian before their destruction in the 1930s. Kalmyk Buddhism of that period had its own story. After the Kalmyk Khanate elimination in the end of the 18th century, the ‘Steppe of Kalmykia’ became another territory of the tsarist Russia, subjected to the military governor of Astrakhan. 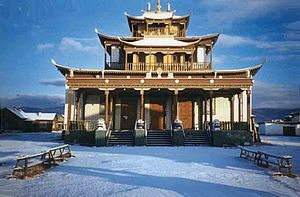 According to the Royal Regulation on Governing Kalmyk People legislated in 1834, the Buddhist church was completely under authority of the tsar administration. It was not long before the revolution of 1917 when the Buddhist family of Russia accepted Tuvinians of the South Siberia, the only Turkic nation confessing Buddhism. Many temples (khures) there had schools for boys to acquire basic religious literacy. The higher theological education Tuvinians usually obtained in Mongolia. For promotion in the development of Russia’s international bonds in the East and particularly for establishing direct ties between the tsarist government and theocratic regimes of Mongolia and Tibet, a Buddhist temple was built in St. Petersburg, the capital of the Russian Empire. The works were funded by Dalai Lama and donations raised in Buryatia and Kalmykia. Bogdo Gegen, the head of Mongolian Buddhists, also contributed a significant sum. An eminent Buryat lama Agvan Dorjiev was in charge of the temple’s establishment and activities. By 1935, about one third of Buryat datsans was emptied because the clergy had either fled or been repressed. A year later, 22 of 29 datsans were closed down under the pretext that they were situated near the state border, and lamas were expelled, accused of being ‘Japanese spies’ and ‘the people’s enemies’. Similar actions were taking place in Kalmykia, as well as in formally independent Tuva. Khurul, Kalmykia, RussiaDuring 1917-1937, 79 temples (khuruls) were closed down in Kalmykia. Shortly after the revolution of 1917, Chore theological academy was eliminated, the other one lasted until 1933. None of the novitiates remained in khuruls in 1937 as result of so-called ‘systematic struggling for the young generation’. Since Kalmyk autonomy was abolished in 1943, and the people were deported to Siberia, the existence of temples and Buddhism in Kalmykia was out of the question. In Tuva, an ‘independent’ state since 1921, the church at first remained untouched. In 1928, the national parliament (Minor Khural) even legislated Buddhism as a state religion. Perhaps this provoked the devastation to begin in 1929, which was enforced in 1930 by the Communist Party’s special resolution on ‘the problem of lamas’. According to the witnesses, lamas were arrested methodically, the top echelon of the clergy at first, then the next ‘layer’, and so on to the very last. In Tuva, like in Kalmykia, temples were burnt to ashes. But while Kalmyks had at least one building unbroken, the stone Princes’ of Tyumen khurul in Khosheut, only the ruins of walls a meter thick of Chadan Khure were left in Tuva. It was only in 1948 that a new monastery was built in Ivolga, near Ulan-Ude, the capital of Buryatia, and one of the buildings of Aginsk Datsan near Chita was re-opened. With the beginning of perestroika, a great number of Buddhist communities was officially registered under the aegis of the Central Religious Committee of the Buddhists of the USSR. Restoration of destroyed monasteries started in the Baikal region, Kalmykia, and Tuva, along with building new temples. St. Petersburg Datsan was returned to the Buddhist community and renovated. A Buddhist Institute was opened at Ivolga Datsan. In Kalmykia 22 temples now. In Tuve about 16. In Buryatia more than 30 temples. Many buddhist center openly in all big city, including Moscow and Saint-Ptereburg. Whole buddhists in Russia about 2000000. ↑ "Russia". State.gov. अभिगमन तिथि 2014-04-20.